Jason Erik Lundberg (jlundberg) has wrangled a book trailer for the Surreal Botany Guide (site). It is produced by the clever folk at Living Jacket, and is a very charming little thing. I tore myself away from Oracle last night (well, okay, I shoved the keyboard away, flipped off my monitor, and said, “Later, doglicker. Just keep throwing those errors all weekend.”), and dashed up the street to the University Bookstore to catch Caitlin Kittredge and Cherie Priest read. Both were a hoot, reading samples from Second Skin and Fathom respectively. I was left feeling like I didn’t need to visit a morgue or go swimming in the ocean any time soon, so those two things are off my list of possible holiday activities. I liked Cherie’s Eden Moore series quite a bit, and with Dreadful Skin, she’s shown a ready voice at historically-flavored fantasy, and so I’m looking forward to reading Fathom, which takes place in the early part of the 20th century and has lots of monsters. Big ones, too, I hear. Caitlin’s another of the local urban fantasy crew that I’ve been meaning to read, and the bit she read from Second Skin was nicely paced and suitably creepy. Especially the zombie voice she did for the monster lady. “Meeeaaaatttt.” Yeah, monsters are always worse when they talk to you as they try to eat you. Anyway, Second Skin isn’t out until March, so we’ll have to settle for the first two books in the Nocturne City series. I know, bummer. TWO books to read first. I’ve been waiting for the killer app that will make the difference in ebook reading, and I may have just stumbled onto it. Stanza. Free for the iPhone/iTouch generation. Additionally, Random House is giving away a handful of titles as a promotional thing. So, free and free. Which means you can be reading Charlie Huston’s Hank Thompson trilogy in about five minutes. I just finished Six Bad Things on the way in this morning, and jonesing for the next one, discovered that I didn’t have to wait until I got home to get it off the shelf. I could be reading it RIGHT NOW. And I will be, as soon as I finish typing. And this is the argument that I’ve always had about ebooks: until it’s as easy as this to load, the cost of entry is too high. I like carrying books with me because you never know when you’re going to get a moment to read. But I hate having to carry two, because invariably, I will finish one shortly after I leave the house. Now, it’s not an issue. I just need a wi-fi connection and I can grab another book. Or I can load up a dozen before I leave. Much like the iPod made it so I didn’t have to carry a CD wallet around for my portable CD player, this sort of app will make it so I don’t have to carry extra books around. And, once they get to a point where I can load my own PDFs into it, I can have Many Hall’s The Secret Teaching Of All Ages with me all the time. Bonus! Solomon stayed home sick today and so we did those things that this small boy likes to do when he is under the weather: crossed bridges, went through tunnels, rode up and down in elevators, and took a trip on the light rail. Along the way we saw a new bookstore, and hustled off the train to do the thing that Dad likes to do: look at books. Meta Books, to be exact. Which is freshly opened (and I wish they had something better than just a parked domain right now, as their logo is very nice), and located right next door to my favorite restaurant in Tacoma. 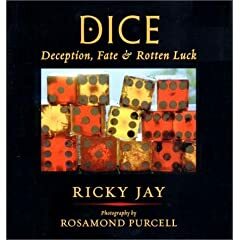 I found a copy of Ricky Jay’s book on dice and Extraordinary Popular Delusions and the Madness of Crowds by Charles Mackay, LL. D.
Some of those are downright extraordinary, all right. Solomon latched onto the dice book immediately and carried it all the way home. We were quite the pair on the train, with our books. Him, celebrating chance; me, celebrating popular insanity.